Delhi, the National Capital of India and Mumbai the Financial. While Fashion & food are like two lifelines for Delhizens, its sensex, film stars and larger than life dreams which gave Bombay its identity. What to talk about those cities which are in news every day? What is that you already don’t know about them and we can tell you? The sole purpose of this two part series ‘Tale of Two Cities’ is to look at the cities from a perspective of two individuals who found everything here from work, home, friends- in short a new beginning to life! For me, Mumbai is a city of dreams. So am I living my dreams, yes you can say that I am living in my dream city. And like me, millions of dream filled eyes come to Mumbai every year to make it big. And it is the place where dreams do become true. The city has something for everyone. So many times we have heard Shahrukh Khan saying, “When I came to Mumbai, I didn’t even have a penny in my pocket.” And he is just one among the many many people who came, saw and conquered. The city is kind to those who believe in themselves. When you hear a morning 6’oclock alarm ring, you just can’t ignore it and sleep back. A minute extra sleep means you will reach the bus stop late. A minute late and you would be welcome by huge queue waiting for 6:50 AM - 461 BEST bus. A minute late at railway station means you will miss your 6:58 AM Churchgate fast local. The effect will be you would have to wait for the next train/ bus and the whole process makes you delay by 20-40 mins at your work place. So the system makes you disciplined. You start valuing time. You prioritise and plan ahead. Number becomes part of your life. When you are in the office, you forget all the hassle you managed to reach the office. At the work place, you meet a hundred people, bright, young with one thing in common - all outsiders i.e. non Mumbaites. And if you happen to come across a localite, you can’t resist exclaiming, “Oh, you are a localite. Cool! Where do you stay in Mumbai? !” So you end up meeting people from various parts of the country and share different cultures but similar dreams – to reach at the top of the world! The day you feel life is getting monotonous, you need a break – you message your friends “Today evening at Marine drive, dinner at Jazz by the Bay.” So you meet up your college friends at the Queen’s Necklace. You chat with them, share stories, watch the ocean waves moving and stare at sky thinking. You land up at Pahlwan dhaba behind the historic and royal Taj President hotel for dinner. Paratha - curry with Coca cola and friends. You end up running towards station to catch the last local. Not that staying all night awake at the sea shore would not have been fun, but the next day office drags you home. A day well lived. *This series will also be published simultaneously on Delhizen’s blog taxfreethoughts.wordpress.com. Part II titled ‘Fashionable Delhi’ will be posted in days to follow! What a tribute to my favourite city! I grew up there spending my formative years in her arms. Though my native is a city in Tamil Nadu, my dad was transferred there and so my first years (and the best) were spent in Ville Parle. Though I was there only for ten years, the city is etched in my memory. I know it has changed in a zillion ways since I left in '89 but still it is always Bombay for me. Fond memories of the place always tease me and I yearn to go back. Though from '89, I have been in Chennai, I can never like this place as much as Bombay! Thanks for this lovely post, Karan. Nice article on the city, Karan. As a person who has never seen the city, I must say it was a good read. And I have tasted Vada Pav, it is good once a while but some people eat it EVERYDAY?? For 5 minutes, I felt that I was in Mumbai. Awesome post!!! An awesome post... I have never lived in such a busy and fast city. I can't imagine u guys spend most of d time @ work! Susan: I am delighted that you liked it! Yes the city has changed a zillion times as compared to '89. I guess anybody who comes to the city and then goes away from the city, end up leaving the heart behind! snowleopard: Thnx a lot for the appreciation. Yeah, there are set of people indulge into it everyday! Jon: You got to expereince it then, it is fun! Niraj: What remains is the soul of mumbai... you summed it all! Nice! 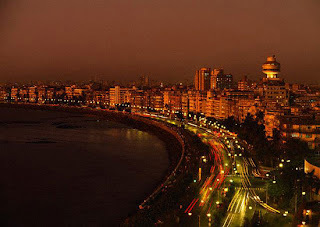 Why do people always say the exact same things 'bout Mumbai?.. I always wanted to go there, dono when I'll get a chance! No wonder it is called Mayanagari !You really love your city . I loved seeing it through your eyes. monotonous yet fun it sounds !! Ana: The city is like that... people do fall in love with it... you should plan to come here!